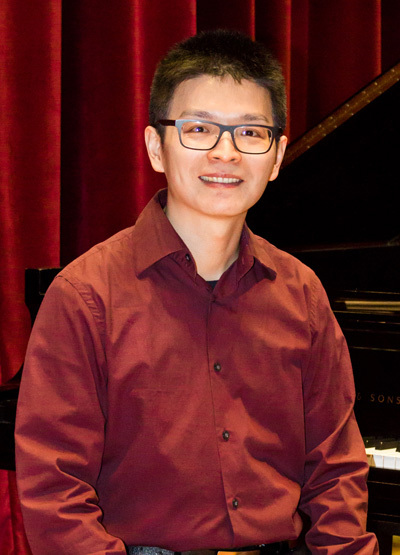 Wei Chen (Bruce) Lin, DMA, holds degrees from University of British Columbia, Westminster Choir College of Rider University, and West Virginia University. Dr. Lin has performed throughout Canada, Mexico, Taiwan, and the USA. He made his first orchestral appearance with the West Coast Symphony in 2002. In addition to his career as a soloist, he is an active chamber musician. He has been featured in music festivals including the Chamber Music Institute at the University of Nebraska-Lincoln, Chamber Music Unbound, Las Vegas Music Festival, Mountain View International Festival of Song and Chamber Music, Scotia Music Festival, and Tuckamore Chamber Music Festival. His performances have been heard on U92 West Virginia Radio Station and Mexico City Cultural Channel. In 2008-09, he completed two artist residencies at The Banff Center where he collaborated with musicians from around the world. With his passion for teaching, Dr. Lin is currently on the piano faculty at University of the Incarnate Word. Prior to this, he was at West Virginia University where he taught applied piano, class piano, and supervised the piano proficiency requirement. Other previous positions include Camp Encore/Coda, Chamber Music Unbound, Kamloops Interior Summer School of Music, Tom Lee Music Academy, and Westminster Conservatory. Dr. Lin is an active member of MTNA. He presents workshops and adjudicates competitions regularly.